Almost wordless: The flowers are beginning to close and transition to seed heads. A sure sign that summer is coming to an end even if the temperatures here are still scorching. The seed heads are almost as pretty as the flowers. 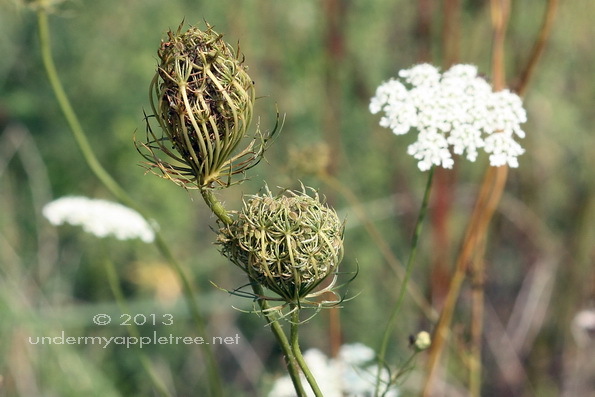 We had tons of Queen Anne’s lace on the farm and I’ve always loved the lacy heads. If you haven’t joined us for Wordless Wednesday on The Jenny Evolution, today’s the day to get in on this fun linky! See you there. Very nice! It’s still wicked hot here, too, but I’ve already broken down to put up my fall decorations. These 92-degree days won’t get me down! I might like the seed heads more than the flowers! How pretty. I’m going to miss summer though. Very lovely photo! We are having a cool spell, but it is supposed to get hot again soon here. I love the seedheads of these flowers — they look incredibly creepy when you use a macro.